It can cause a drop in milk supply. 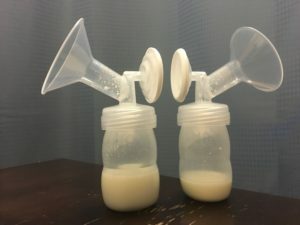 Not every women experienced this, by side notice that starting a few days before their periods, their milk supply drops a bit. This lasts until a few days after the period has started. It can slightly change the flavor of your milk. Again, this isn’t true for everyone. But Aunt Flo can slightly alter the flavor of your milk, making it less palatable for your baby. This alteration starts a few days before your period, and lasts until a few days after your period has begun. The result? If your pumped milk is looking a little lean, you may just be about to ride the crimson tide. Make sure you’re eating a week balanced diet with foods rich in calcium when you start PMS’ing. Chocolate is high in calcium, right? Happy pumping. PS this picture is from my morning pump. My baby started on the right side this morning and didn’t really want anything to do with the left side. See the difference?